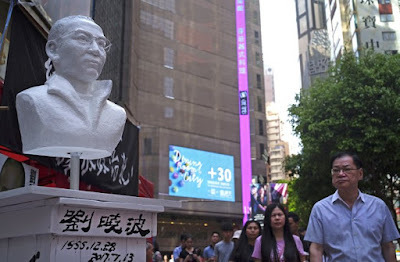 A few days before the 29th anniversary of the Tiananmen Square massacre in June 4, there was a makeshift booth set up on the edge of the Times Square shopping mall in Causeway Bay and it featured the bust of the late Nobel Peace Prize winner Liu Xiaobo. The group of activists who were manning the booth received notices from the mall, which is owned by Wharf Holdings, saying they did not get permission from the mall to have a stand and if they didn't leave they would be sued for illegally using the space and using loudspeakers to disseminate political ideas and solicit donations. At first they came to a temporary agreement, and the group even unveiled a 1.5 metre high statue of Liu sitting in a chair and smoking a cigarette last Tuesday. However, the mall issued another letter saying it was seeking an injunction order if they refused to leave. 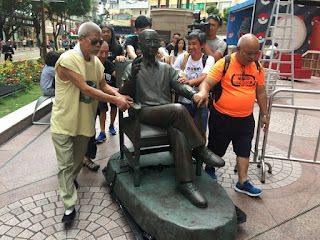 So earlier this afternoon, the group avoided legal action by putting Liu's statue on a set of wheels and slowly moved him to Paterson Street, also in Causeway Bay to a nearby mall called Fashion Walk. The activists are hoping to display the statue until July 13, the first anniversary of Liu's death. We'll have to see if the statue remains at the second mall without too much trouble. The activists were hoping to stay in Times Square because so many people pass through the area everyday, thus increasing awareness for Liu manifold. It was the perfect place for mainlanders to know more about who he was and what happened to him, but the mall's owner would rather they not get into politics and come into the complex to shop. So Liu now has a new home... how long will he get to stay there?